Yo, what’s up? hope all good with y’all. Now that your training comes into its last phase, it is time to talk about the transition in this instalment of the Olive’s triathlon 101 in the run up to TRI Yas by Daman Activelife. No, of course, nobody wants to be lost in transition. So hereafter you can find a couple of easy pointers on how to make it easier for you. The bottom line in both transitions is to use as little time as possible to get changed from one discipline to the other. In order to do that, you have to develop your routine on how to do it quickest. 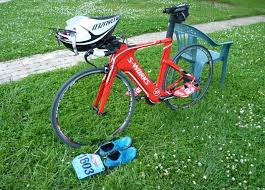 For gentlemen like Alistair Brownlee in ITU racing, transitions are crucial and very much part of the race: every move has to be superquick and razorsharp and even the changed equipment has to be placed in a basket next to the bike rack, if not you get hit with a time penalty! That’s pretty much it. keep it simple. not cluttered. no pics of the dog or similar. saddle back, aerobars in front, helmet open straps on top, bike shoes clipped in, I also place the race belt with the number on the aerobar, shoes on the ground next to the bike, I also have placed the shoes on a colourful towel so I can spot it better from afar. so, try to get the wetsuit open and the upper part up to the waist only off as quickly as possible. 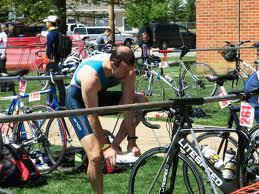 please remember you are allowed only to take the complete wetsuit once you reach your rack!!!!!! 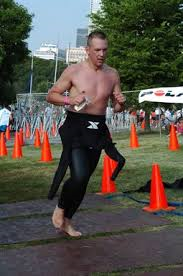 that’s how you have to run with the wetsuit up to your spot. once you get to your station, don’t put the wetsuit off just yet. first put the helmet on, strap must be closed. then strip off the wetsuit, you will save some time. 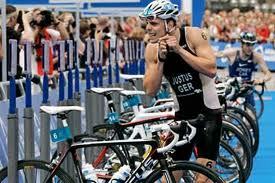 then race number, then take the bike and push it out of T1. 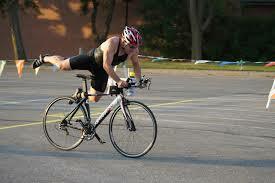 push the bike out with the one hand on the saddle and the other hand pumping to run fast. 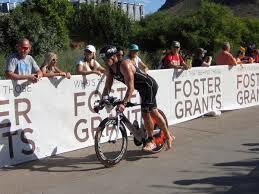 And please do yourself a favour and all the others in transition: DO NOT RUN WITH YOUR BIKE SHOES ON! its dangerous for you and you block the way for the others to run through the T.
you can mount the bike by doing the flying mount like above or normally stop briefly and lean the bike sideways and mount as such. On our level, it does not make such a difference. 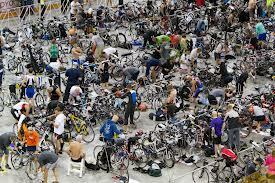 shortly before getting to T2 and off your bike and into your running shoes, open the Velcro of both your shoes and slip out and step onto the bike shoe with your bare foot. once you are with bare feet on your shoes and you approach the dismount line, prior lift either your left leg or right leg ( depending on your preference ), over the saddle and stand on one side of the bike with both your legs, one leg on top of the shoe, one leg lightly and comfortably swung behing the leg on the shoe and jump off the bike with your bare feet on the ground. Don’t worry it won’t hurt, it’s like walking bare foot in your garage. please remember, you are only allowed to unstrap the helmet and put it off once you reach a complete stop at your rack. Here again, please keep the helmet for a little longer and slip into your shoes first, saves some time. slip into your shoes then. 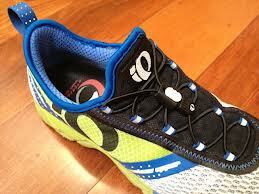 here I recommend a very central piece of triathlon equipment: the elastic shoe lace. beats tying the shoes every time and they are as easy to put on like your Louis Vuitton loafers, holla at cha boy. you can put your shoes on either sitting on your bum, but you have to get up again, or you can stand slightly bend over, I always do that, and then slip into them one shoe at a time. now grab your sunnies or some drink if you have planned that and run off.